If you haven’t noticed by now, social listening is kind of a big deal for brands today. Why? Because we’re capable of learning more than ever by tracking our customers’ social behavior. What products are people digging? What’s got your industry buzzing? 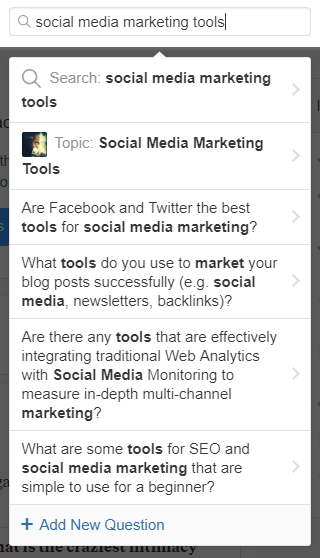 Through social listening, you can answer these questions and so much more in an instant. But while the importance of monitoring your mentions and conversations is a no-brainer, many brands are actually missing out on some crucial interactions because they’re stuck in a bubble. Reality check: there’s more to listening than just the “usual suspects” such as Facebook and Twitter. To guarantee a complete picture of your business’ online presence, stepping up your online social listening is a must-do. What is online social listening? When we talk about online social listening, we’re referring to social sites beyond “the big five” (Facebook, Twitter, Instagram, LinkedIn and Pinterest). Consider the sheer popularity of sites such as YouTube, Reddit and Quora. Each is a hotbed of discussion about brands and likewise places to capitalize on mentions from customers. And while you may not think of these platforms as social sites, bear in mind that they do represent active communities with profiles, comment sections and opportunities to engage with businesses. Sounds pretty “social” to us! However, we’d argue otherwise based on the benefits highlighted below. There’s a universal expectation for businesses to reply in a timely manner to customers on social media, right? Now think about when happens when you fail to reply at all. Not a good look. If you have negative comments simply sitting around on a social site, you’re neglecting your online reputation. On the flip side, failing to respond to questions or even positive feedback from customers would mean a missed opportunity for another sale. And unlike social media where customers might tag you when talking about you, these conversations tend to fly under the radar unless you’re explicitly seeking them out. Through online social listening, you ensure that no potential touchpoints with prospects or customers go unnoticed. Discussions about your brand and industry at large are happening far beyond the realms of the Twitterverse. 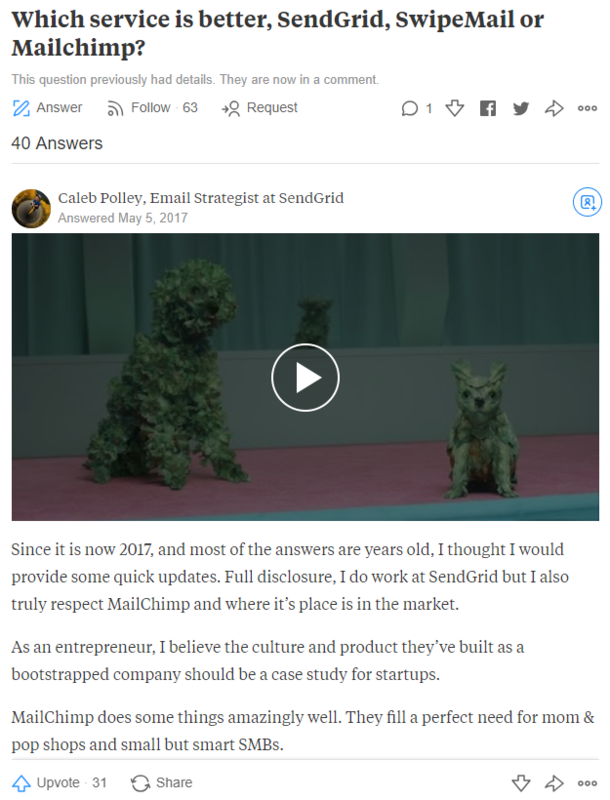 Reddit and Quora, in particular, are prime places to learn about industry trends and businesses related to your business’ niche. These sorts of threads are insightful as they’re organic and unfiltered. When people are talking about your space, ask yourself: are you part of the conversation? At the end of the day, online social listening gives you a more comprehensive understanding of your brand sentiment. The conversations people are having on your Instagram or Facebook might be night-and-day versus other online forums. There’s no logic in listening to feedback from particular segments of your audience instead of everybody. Brands should be able to monitor their presence across all social platforms. This is especially true given that consumers on sites like YouTube or Reddit can represent high-intent buyers who can teach you a ton about what your new customers are looking for. Good question! Although we’ve already covered some the staples of online social listening, let’s dive into the specific platforms and what sort of keywords and terms you should integrate into your listening strategy. As video content continues to take over the web, YouTube represents one of the fastest-growing communities online. And while it’s no secret that people love to watch videos, but the degree to which consumers use videos for product research is staggering. Recent video marketing statistics note that 80% of people note that videos are helpful in making purchasing decisions. People are sounding off on products like never before and are using YouTube videos as a creative medium to do so. If you want to know where your business stands on YouTube or what your customers are thinking, you need to know what terms to track. Online social listening on YouTube starts with your brand name. 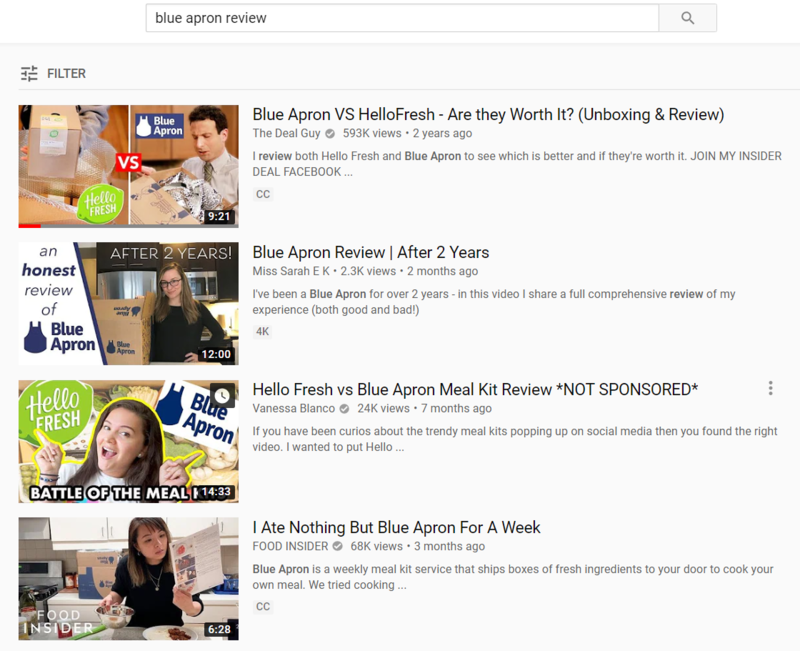 Here’s a good example of curated reviews for Blue Apron. It’s beneficial to not only know what customers are saying about you but also the fact that folks are creating content on your behalf at all. Beyond your brand name, “how to” queries are great to track as well. 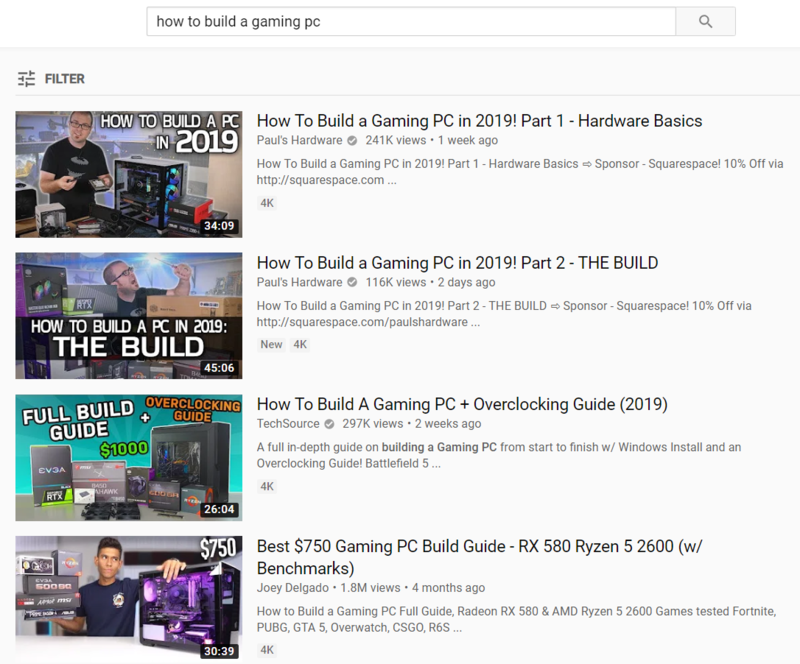 Educational, tutorial-style content absolutely kills it on YouTube. If you want to know if people are listing your products or you want to be featured in such tutorials, you need to know what your customers are learning. “Best” queries are also worth tracking on YouTube, such as “best WordPress plugins” or “best Orlando restaurants.” The popularity of listicles and best-of’s, even in video format, speaks for itself. Oh, and don’t forget the actual actions you can take on YouTube as a result of your online social listening. Just as we always recommend brands to reply as swiftly as possible to customers, the same rings true to YouTube content. Showing your viewers some love for them giving you their undivided attention is the least you can do. Monitoring your comment section and notifications can actually help you breed brand loyalty. For example, companies like Beardbrand actively monitor and reply to comments on each and every one of their videos. Frequent discussions, debates and fun back-and-forth in the comment section between the company and its followers have created a sort of cult-like following that Beardbrand obviously appreciates. What makes Reddit so complicated? 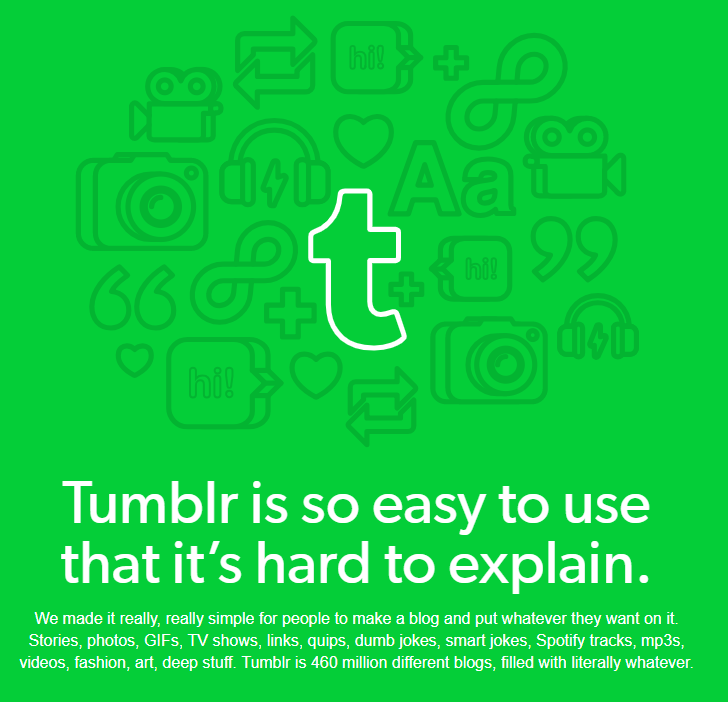 Simply put, its user base is not exactly friendly to businesses or marketers. Most posts or comments that are deemed to be advertising or something self-promotional are usually downvoted into oblivion. Even so, Reddit is a massive forum of discussion when it comes to brands, products and services. Many consumers flock to Reddit solely because it’s free of promotion and marketing spam. Just look at any Google query for a general product, business or service. The term “Reddit” will pop up alongside such terms as people want authentic opinions rather than SEO results. So, what should you look for on Reddit? If you’re a brick-and-mortar business, we recommend following subreddits related to your business and industry. 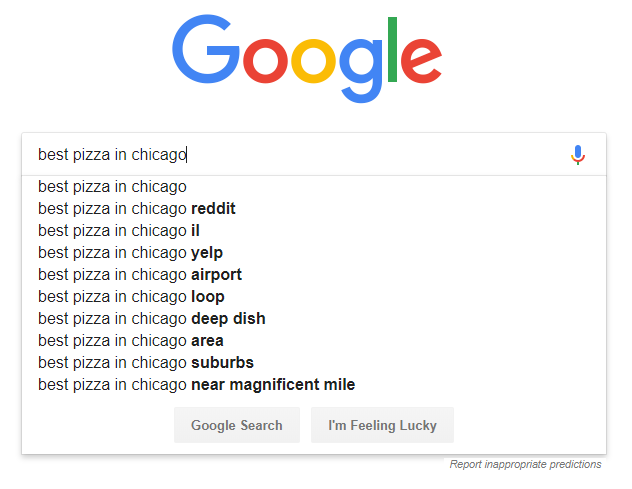 For example, a restaurant based in Chicago would be wise to monitor brand searches in /r/ChicagoFood. The same can be applied to other subreddits such as /r/ChicagoSuburbs or /r/Chicago. These are the places where you’re going to see your business’ name come up. Also, monitor industry and product-specific subreddit. 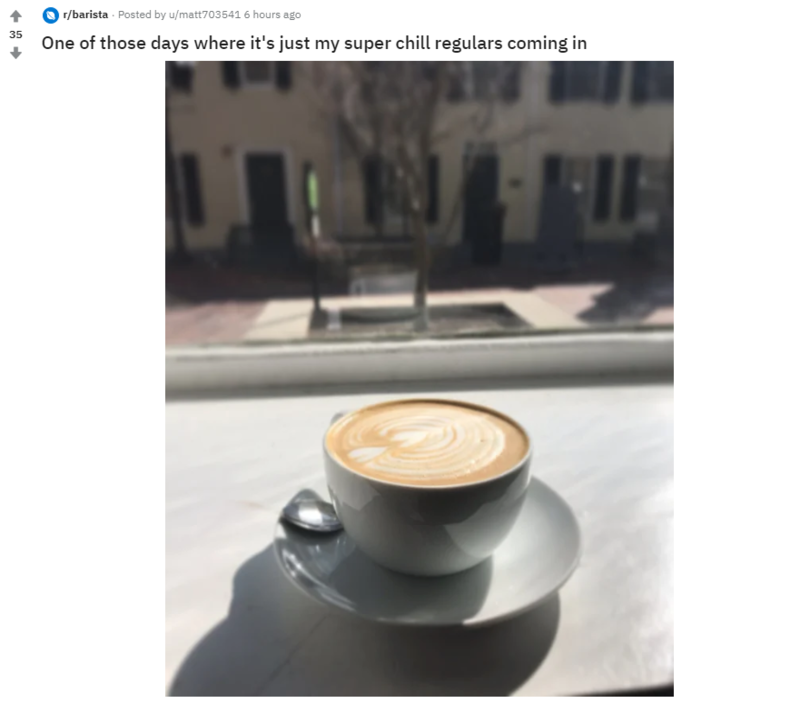 For example, a local cafe should not only follow geo-specific subreddits, but also niche ones such as /r/barista. These types of subreddits are prime spots to curate content ideas and even post your own social content if it’s relevant. Unlike other social networks where responding to comments is the norm, brands should tread lightly on Reddit. This is perhaps the best example where your online social listening may quite literally just mean listening. If you do decide to respond to someone, be sincere and transparent about your intentions. For local businesses, online social listening on review sites is non-negotiable. Assuming that you’ve already claimed your profiles on sites like Yelp and TripAdvisor, you can prioritize your notifications accordingly. Review sites are beneficial for beefing up your online reputation while also keeping tabs on others. 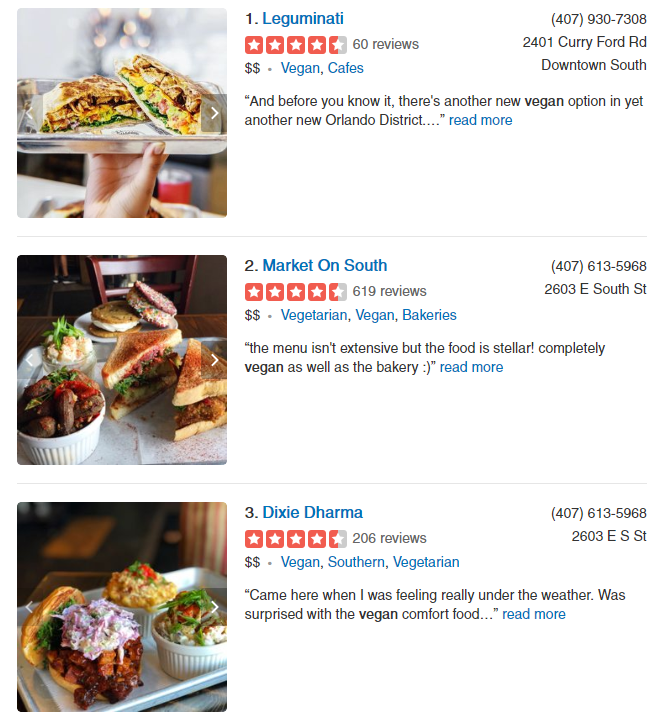 For example, tracking business categories and key terms (think: “vegan” or “vegan Orlando”) can clue you in on new competitors in your space. Yelp! offers a “community answers” section which serves as an opportunity to reply to customer concerns. As noted in our guide to customer relationships, responding to these types of comments can reduce churn. Doing so also proves that you’re an active, attentive business owner who cares for their customers. The keyword here is “listening.” Yes, review sites and star-ratings have made the service industry absolutely cutthroat online. Regardless, you need to be tactful in how you listen to and respond to complaints and praise alike. Take the time to craft thoughtful responses. Adopting a “kill them with kindness” mentality can help keep your business in a positive light even in the face of less-than-stellar customer experiences. On the flip side, responding to good reviews gives you satisfied customers all the more reason to come back. Don’t forget that tracking data is a key component of online social listening. 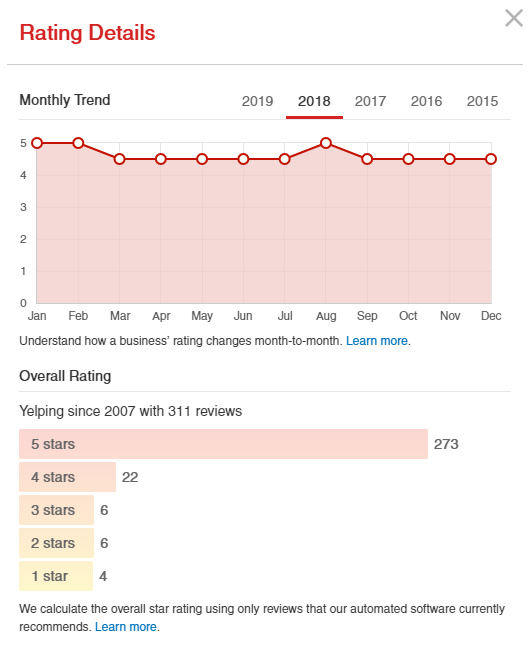 Yelp actually allows you to track trends in your reviews to ensure that your reputation stays on the up-and-up. Although reviews on such sites can be brutal, it’s important to look at the big-picture versus one-off reviews. Quora has become increasingly popular for B2B professionals within the past few years. Serving as a Q&A platform, Quora is sort of like Reddit in the sense that pure self-promotion is discouraged. Those answering questions are expected to offer meaningful, authentic insight rather than just dumping links. 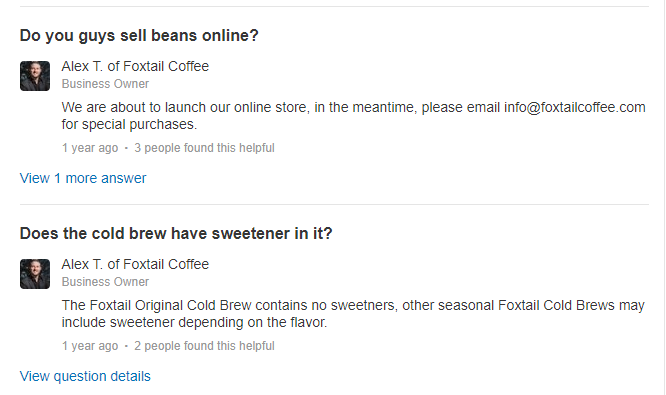 Quora allows you to search specific brands and products within questions and answers alike. This allows you to track to track both people talking about you as well as those who might site your business as a solution. Businesses should follow as many topics and queries relevant to their industry as possible. You then have a wider breadth of potential questions to answer in addition to places to pick up on conversations about your business. Regardless, it’s an incredibly popular platform for creative types and bloggers in certain B2C spaces. 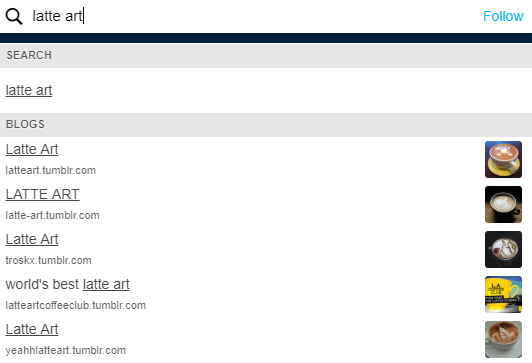 Tumblr allows you to search and follow keywords in addition to specific blogs. Following topics will populate your feed with popular images and blogs from that tag. This can serve as yet another avenue for inspiration depending on what you’re looking for. Between all of these platforms in addition to the more “standard” social sites, you need a concrete strategy for social listening. Because going site-by-site is not only incredibly daunting: it’s downright inefficient. Remember what we said earlier about taking a holistic approach to listening? 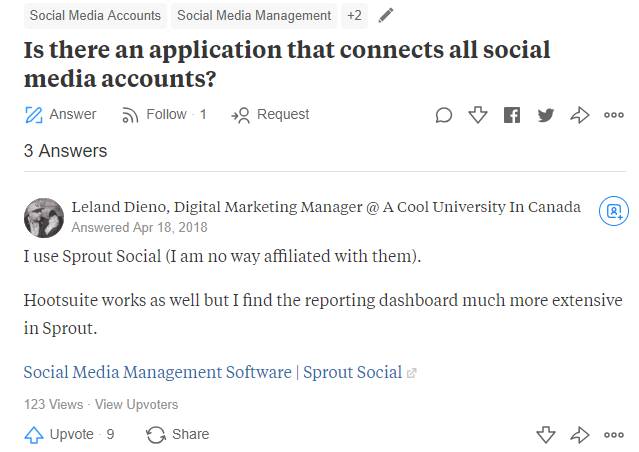 Through tools like Sprout Social, you can monitor all of your online social listening queries and data in one place. 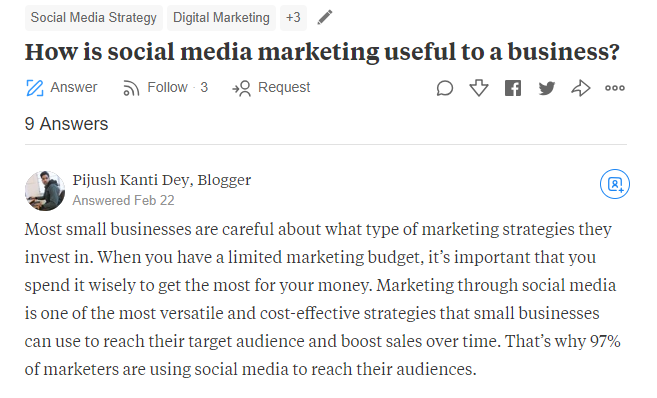 Rather than jump from individual social mentions and RSS feeds, Sprout aggregates your defined terms such as your social accounts, hashtags, industry keywords and more. There’s no denying that there’s a lot of ground for businesses to cover when it comes to social listening. But that doesn’t change the fact that customers have plenty to say and expect brands to respond. Hopefully now you have a better idea of how you can uncover those conversations yourself. Through effective social listening, your business can win over more followers and customers alike by capitalizing on the moments that matter most online.